Last year, wind power production in Germany increased by around 50 percent – and the country already had the third largest fleet of wind turbines worldwide. But the biggest improvement is in minimum power production. Your German word for the day is “Dunkelflaute.” Craig Morris reports. In December, more electricity was generated from wind turbines than from any other source. 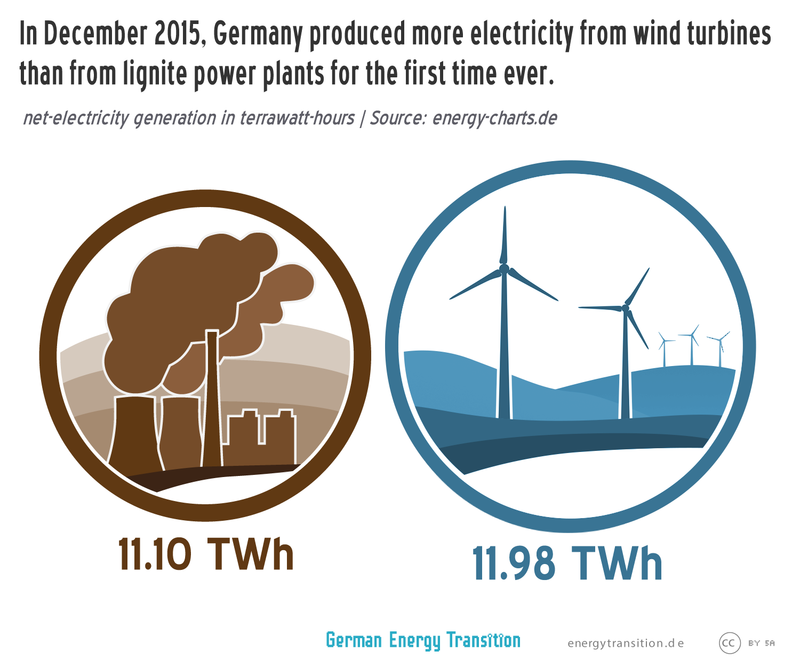 For the first time ever, wind power topped lignite – but it won’t be the last. In addition to the monthly record, a daily record of 32.6 GWh of wind power was also set in December 2015, as our colleagues over at Strom-Report illustrate below – and if you are wondering about the discrepancy between our 11.98 TWh and their 12.7 GWh, you will want to read this article about how live statistics are just guesstimates. But today, I’d like to focus on something else: the lows. In previous reports on record highs, I have consistently pointed out how extreme lows are never far away from record highs. For instance, wind power fell below 1 GW on four different occasions in the previous record month of December 2014, even as it peaked at around 30 GW. What’s more, wind power generation remained below 5 GW from December 2-7. Here, wind power production does not fall below 1 GW at all; the low for the month is around 1.4 GW. And production only drops below 3.7 GW three times. Furthermore, it did not drop below 5 GW for any extended timeframe. What’s going on? 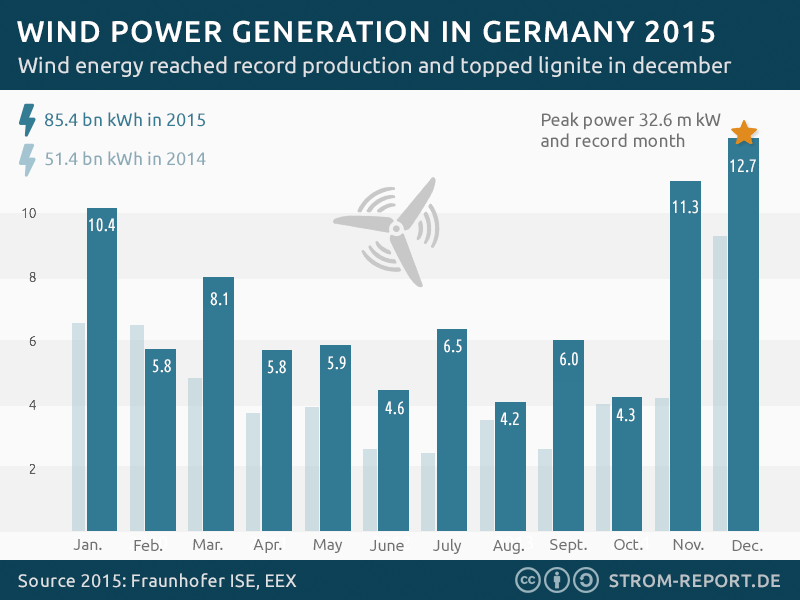 2015 was the first year of significant offshore wind power production in Germany. Offshore wind farms have capacity factors roughly twice as high as onshore projects in Germany. In other words, a single wind turbine produces electricity twice as often because the wind is more constant over the water. The minimum for wind power generation can be expected to increase significantly in the coming years. Germany has a target of 6.5 GW for offshore wind by 2020 – compared to 2.5 GW installed at the end of 2015. Policymakers are also currently investigating whether that target should be increased to 7.7 GW. 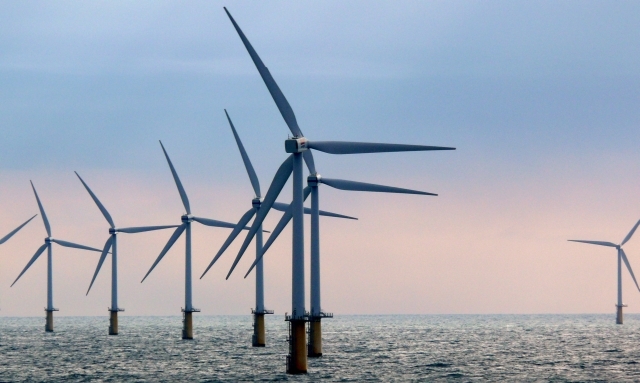 Various scenarios for midcentury have dozens of gigawatts of offshore wind. The result will be a much higher minimum level of wind power. Combined with hydropower and biomass, which generate nearly 10 GW of electricity around the clock, Germany therefore now has around 15 GW of renewable electricity even at low points of power production – compared to an absolute peak demand of around 80 GW and more normal daily peaks of 60-70 GW. This issue is crucial because shortfalls in renewable power production somehow have to be compensated for. At present, conventional power plants fill the gap, and eventually stored renewable electricity will increasingly. The former is undesirable in terms of the climate (these are fossil-fired power plants); the latter, in terms of cost – storage makes electricity more expensive. In German, the term Dunkelflaute is used to describe the predicament. Dunkel means “dark”; solar is simply not available half the time, and solar power production is significant for only around six hours a day even when the sun is shining. Flaute is “doldrums” – when the wind is not blowing. So the “dark doldrums” are times when solar and wind power is not available in sufficient amounts. As wind power (both on and offshore) continue to grow, the minimum level of renewable power production could rise to around 20 GW by 2020. Offshore wind will be crucial in addressing the Dunkelflaute, but the capacity factors of onshore wind turbines are also increasing by leaps and bounds. In the US, NREL published a new map of wind power potential last spring, showing that the latest turbines with taller towers and longer blades are able to produce electricity from even meager wind sources, revealing wind power potential practically across the entire country. French expert Bernard Chabot has been writing about this trend for years. His most recent overview of Denmark clearly shows how capacity factors have increased over the past two decades for onshore wind turbines. But even in Denmark, the turbine fleet falls below 10 percent of its rated capacity around five percent of the time. This issue is not going to go away. But let’s look at this historically. In 2004, 20 percent green power as a yearly average was the target for 2020. By 2020, Germany will have trouble falling below that level for even brief periods. Sorry, this argument does not fly. With an avarage demand of 60-70 GW it does not really matter whether we have 5 GW wind or less. To cover the “dunkelflaute” we need either a lot of open gas turbines, which run only a few hundred hours per year, or a lot of transmission capacity to Scandinavia, where we have more than enough hydro power potential. 50% more wind power despite 1% less wind than average ! Previous PostCan Germany reach its renewables target for the energy sector for 2020?